52nd Sunday newspaper story; 28 Dec 1958 - 14 Jun 1959. Previous Frew appearances: #327 (1966), #481 (1972), #659 (1979), #868 (1986). 96th daily newspaper story; 26 Dec 1966 - 18 Mar 1967. Previous Frew appearances: #352 (1967), #502 (1973), #680 (1979), #910 (1988). 141st daily newspaper story; 21 May - 8 Sep 1979. Previous Frew appearances: #684 (1980), #913 (1988). 116th Sunday newspaper story; 18 Apr - 5 Sep 1982. Previous Frew appearance: #840A (1985). 121st Sunday newspaper story; 13 May - 19 Aug 1984. 126th Sunday newspaper story; 4 May - 31 Aug 1986. Previous Frew appearance: #899 (1988). 160th daily newspaper story; 7 Jul 1986 - 11 Apr 1987. Previous Frew appearance: #880A (1987). 128th Sunday newspaper story; 28 Dec 1986 - 28 Jun 1987. Previous Frew appearance: #887 (1987). 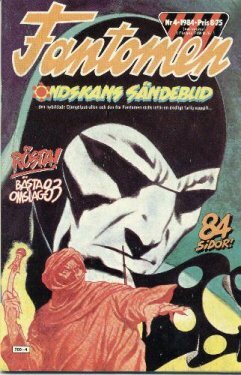 First published with the title Messenger of Evil in Fantomen Nr.4/1984 by Semic (now Egmont), Scandinavia (F247). Original cover shown on the left, thanks to Phantom Kingdom. This story is the 11th in a new series of previously unpublished Semic Classics . For others see #1339, #1341, #1342, #1344, #1345, #1348, #1351, #1355, #1359, #1364. Presenting - Frew's 14th Annual Special! The production has long been regarded as the major event each year in Australian comic book publishing and I hope the latest offering brings pleasure and excitement to everybody. As usual, we have included a bonus offering of an historic Frew replica edition and this year it is a faithful reprint of #13 as originally published in 1949. The replica contains an edited version of part one of The Golden Circle , so ignore the story title on the front cover. As explained so many times, this was the unique Frew approach all those years ago! It is worth pointing out that the reason for this 14th Annual Special containing a replica of Frew #13 is that our third Annual, published in 1993, did not contain a replica and instead, featured a lift-out colour poster. Covers for this year's Annual are by Antonio Lemos. The Special contains nine stories and all the usual features, including the complete Frew Publishing Chronology for 2003 and details of the stories and covers which were voted the most popular by readers. As is always the case, many enthusiasts will be surprised at the results of the polls. All eight Lee Falk stories included in this year's Special are complete (most for the first time!) and once again, I must express my thanks to King Features archivist Mark Johnson for going to so much trouble to unearth such beautiful repros. Thanks are also extended to Frew's resident historian, Barry Stubbersfield, for helping so much with background data on all the Lee Falk adventures. Barry's research into Lee's work on The Phantom is unmatched anywhere in the world. 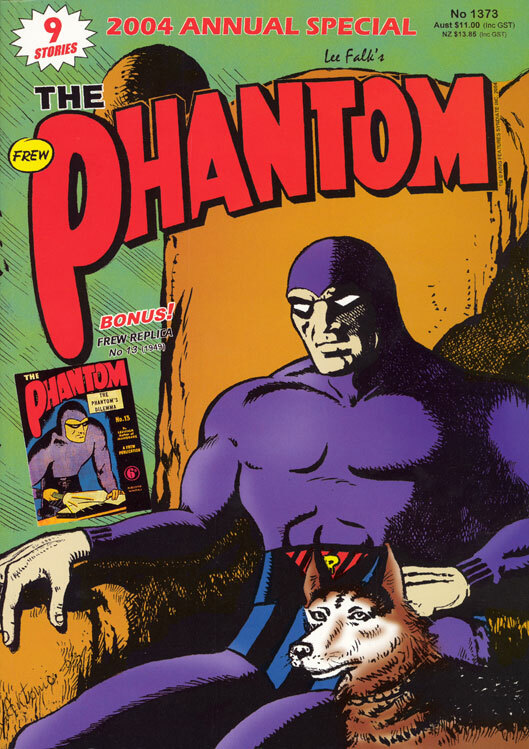 Rounding off this issue is a never before-published Phantom adventure originally published in Scandinavia with script by Norman Worker and art by Kari Leppänen. The Message is essentially an attempt to explain the origin of the Good Mark symbol, but as you will discover, it goes a lot further than that! 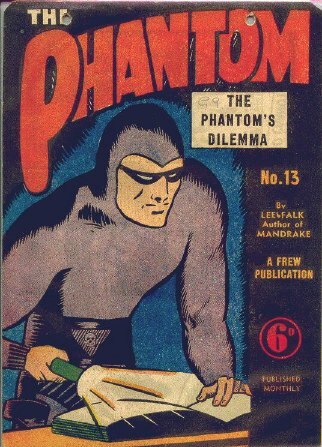 For Those Who Just Came In, the line-up of Lee Falk Phantom stories will prove fascinating. Most have been out of print for 15-16 years and provide not only great entertainment, but a wonderful insight into the changing style of artist Sy Barry as he fine-tuned his depiction of The Ghost Who Walks and all the supporting casts. At $11.00 (includes GST), the Annual always provides wonderful value for money. It is more than two and a half times the size of a traditional 100-page edition and comes with a bonus replica edition - all for only double the price of a 100-page issue! We have once again managed to retain our original retail price of only $10 (GST came later) which was the cost back in 1991 when we published Frew's 1000th Issue, which was the first of the Annual Specials. Since 1991, the cost of newsprint and printing has skyrocketed, but for this production, we decided our loyal readers had to come first and absorbed the many price hikes as our way of saying a sincere "thank you" to the most dedicated comic book public in the business. The year 2004 should be an exciting time and all at Frew are looking forward to helping preserve the legend and bringing all enthusiasts the best available stories from the United States and Scandinavia. Our 1500th issue is now not too far away! Check the New@Egmont, Frew Reprint Schedule, and The Missing Semic Stories pages for details of other upcoming stories. Frew in Review: 1997, 1998, 1999, 2000, 2001, 2002, 2003.